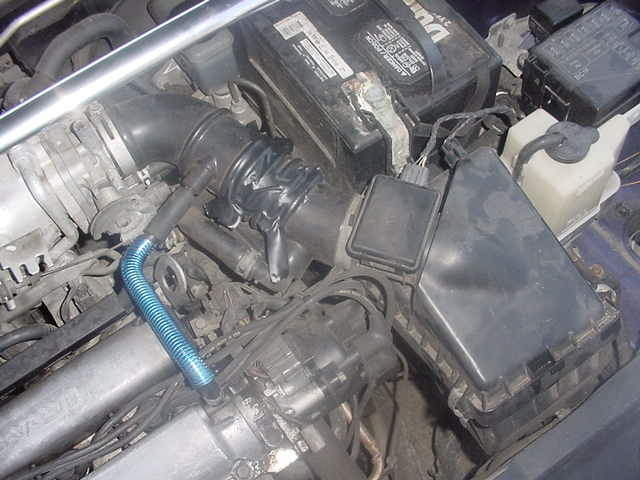 I was wondering on a 95 1.5l if its possible to put a cone filter on the stock intake tube? We put one on my friends 98 contour and it added a throaty sound out of his stock exaust and we notice a big gain in response timing. But the 95 1.5l Im not sure how to do it with this sensor on the tube. What will happen if i put a filet on and dont have the sensor? Will it mess my air/fuel ratio up? check out the thread on the bottom of this section. my car is a 98 but has the 1.5l which didn't change. you could put a filter straight on, but then you'd have a sensor that fits into the air box just hanging around. i bought a bent pipe and cone filter and did that. i couldn't say anything about the air/fuel ratio...i forget if 95 for the protege was OBD I or II. my mileage didn't go down, but i got a little more zip. Last edited by cornercarve98; November-13th-2005 at 03:28 PM. ok thanks yeah the 95-98 motors are exactly the same no changes so do you have a pic of the pipe and all? And i would need the stock airbox there for the sensor to sit in? I bought a 3" bent pipe from AutoZone and a cone filter (both Spectre brand...ya, that was what was available). The bent pipe was all officially shiny and stuff, with a PCV valve connection point and an auxilary sensor port or whatever (I think they had that sensor in mind). I had to cut off like 2.5" off the pipe to fit it and the filter into the engine bay...let's see if I know how to make a thumbnail...ok sweet. Last edited by cornercarve98; September-22nd-2007 at 09:40 PM. ok that pic helped alot dude but one more question...is that stock hose thill there and you just attached the new spectre pipe to the sensor? I couldnt figure out how to get the end of my pipe out of that box. There are I believe 4 screws that secure the MAF to the stock air box. I took those out, and then took out the screws that secured the air box to the car frame. There is a peice of metal that serves as the mounting point for the air box and stuff, and so I detached that as well. Below the air box is a squiggly looking pipe that goes down to near the bottom of the engine bay. It's attached to a white resonator type box/chamber--of which you can only see the tip of (where the black pipe and it connect)--that sits in a sort of closet of the engine bay (in front of the left front tire, behind the front bumper). Your OEM air intake path comes from the top of this "closet" right behind the front headlight...it's messed up. I detached the squiggly pipe from that box. That ought to work just fine for you. I went further and removed the resonator deal (which meant taking off the bumper...it took a while, but if you like Legos then you'll be ok with it). I wouldn't suggest doing that, just because it takes a while and requires one to keep track of everything. So to answer your question, the accordian hose from the throttle body to the MAF is stock. The MAF sits there, and the bent pipe attaches to it and goes down. Does that help? one more thing conercarve98 if i just let that sensor hang is there any way it could damage anything such as my air ratio or what is it for? I have no idea what it is for. I hope someone else does here, or knows where to find it. I wonder if it is a temperature sensor...either way, I think it best just to put it in the new pipe and not let it hang. Ive done this mod before, mainly just a two pice fix, but I would not recommend it. the mod its self is easy, but when I did it, i noticed my mileage slightly dropped and it acted like it was getting TOO Much air, and letting the MAF thing sit there wont hurt it, just make sure the filter doesnt come off, i wouldnt recommend a cone filter unless you have the actually intake replaced..but thats just me.